Part 1 Biosynthesis and chemical structure: Structural studies of plant cell-wall polysaccharides using enzymes; A new method of enzymic analysis of amylopectin structure; Structure-function relationships of R-Glucan Hydrolases in barley; Starch synthesis in transgenic plants. Part 2 Rheology: Constitutive models for dilute and concentrated food biopolymer systems; Viscoelastic properties of mixed polysaccharides systems; Determination of the density of starches and cereal products as a function of temperature and pressure; Factors affecting the wall slip behaviour of model wheat flour doughs in slit die rheometry. Part 3 Nutrition: Nutritional importance and classification of food carbohydrates; The glycaemic response after starchy food consumption as affected by choice of raw material and processing; Resistant starch: Measurement in foods and physiological role in man; Soluble dietary fibre - a useful concept? Part 4 Industrial uses: New industrial uses of starch; Properties of small starch granules and their application in paper coatings; Technical applications of galactomannans; Edible fiber from barley and oats by wet-milling. 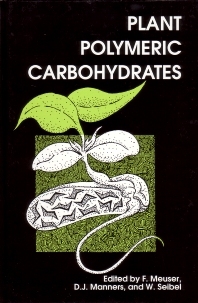 Part 5 Chemical and enzymic conversion: Solution properties of plant polysaccharides as a function of their chemical structure; Structure and function of barley malt a-amylase; Use of extrusion processes for enzymic and chemical modifications of starch; Study of cellulolytic hydrolysis of furfural process wastes; Non-fickian diffusion with chemical reaction of a penetrant with a glassy polymer: The gas-solid hydroxy-ethylation of potato starch; Characterisation of maltodexain gelling by low-resolution NMR.